On Jan. 8, the masked heathens known as Hollywood Undead will invade stores with Notes From the Underground, their third studio album. Produced by Griffin Boice (Rob Zombie), Sam & Sluggo (Gym Class Heroes), and Danny Lohner (Nine Inch Nails), Notes follows the group's near platinum-selling 2008 debut album, Swan Songs, and its acclaimed 2010 follow-up, American Tragedy. Today, Noisecreep is bringing you the exclusive premiere of the album cover art for Notes From the Underground. 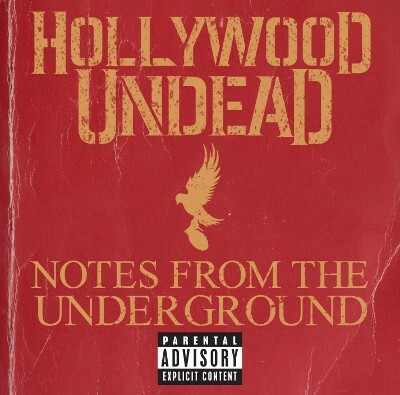 Notes From the Underground will hit stores on Jan. 8 and can be pre-ordered at this link. Stay tuned to Hollywood Undead's Facebook page for more information on the new studio album!